ARLINGTON, Va. (May 10, 2007) -- In 1949, Benny Nagro, 19, was looking for some excitement, so he decided to transition from the Navy Reserve to the "regular" or active-duty Navy. "Since they didn't ever pull my (reserve) squadron, I went down to enlist in the regular Navy," said Nagro, a Washington, D.C., native. 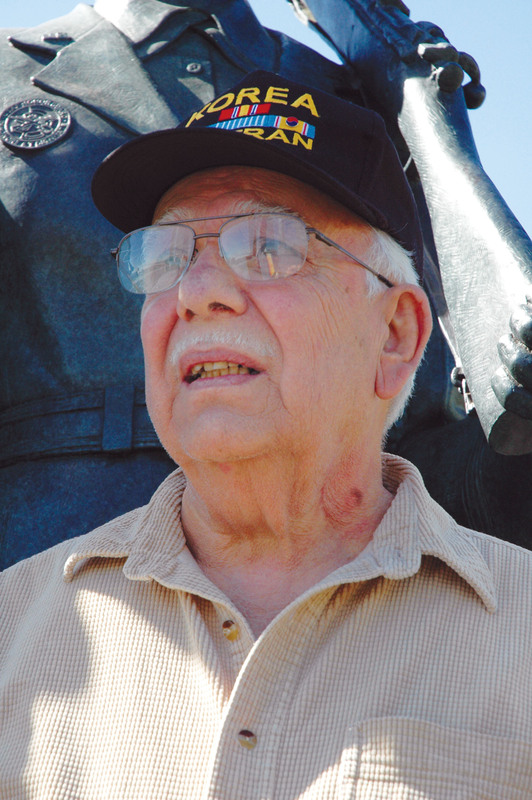 Benny Nagro, an Air Force and Korean War veteran, visited the Air Force Memorial May 8. Nagro entered the Air Force in 1950, when the Air Force was but 3 years old, and served in Korea from August 1951 to August 1952, as a percussionist in the Air Force Band. But Nagro said Navy recruiters in a Washington, D.C., recruiting station near the White House weren't biting, so he left. "I walked out -- I had my Marine Corps buddy with me from high school -- and we saw a big sign that said 'Join the Air Force!,'" he said. "It was a new service then. They had blue uniforms, and we went in and talked to the sergeant. He piled it on, man. He said they'd give me a haircut, and a room and all that stuff. So I signed up." A lot of others must have decided to join the fledging Air Force at the same time, because basic training facilities at Lackland were packed, Nagro said. "By the time we got down to Texas -- we had a troop train -- they had so many people down there at Lackland that we didn't really have any place to sleep," Nagro said. "We slept on the gymnasium floor. They said don't bring any clothes, just bring a toothbrush and one pair of underwear." Nagro said he'd done an interview with the Air Force Band at Bolling Air Force Base. He'd been in the band in high school, and the Air Force wanted him to do largely the same thing while in uniform. "They wanted me in the band, and they wanted me to stay in Washington," he said. "I told them I was born and raised here, and I didn't want to stay here!" Instead of staying at Bolling, Nagro was sent to Hill Air Force Base, Utah, to serve as part of the 549th Air Force Band as a percussionist. "We marched there in the street and the people thought we were postman," he said. It wasn't long before the Air Force was looking for volunteers to go overseas. Nagro was more than willing to go -- to Europe. "They asked for volunteers to go overseas, and I said I'd be glad to go to Europe, I'll volunteer. I always wanted to go to Europe," he said. "But they sent me to Korea instead." Nagro served in Korea from August 1951 to August 1952. He was part of the 5th Air Force in Seoul. "It was tough there," he said. "There was a war going on, we had artillery fire. You'd see the guns going off at night, and the airplanes -- Bedcheck Charlie (Polikarpov U-2 or Po-2) and all that dropping hand grenades or something, keeping you awake. They gave me a carbine with no ammo and a helmet with no liner. They put us on guard duty. Sometimes one guy wouldn't show up and then you're standing there by yourself, during an air raid." During his time in Korea, Nagro played with the Air Force Band all over South Korea, also pulling additional duty as a guard. After Korea, Nagro was moved to Vance Air Force Base, Okla. He stayed there, at a training command, until the Korean War was over in 1953. Following the Korean War, Nagro worked in real estate and also as a public servant in Prince George's County, as a building code enforcement officer. He also attended the University of Maryland to pursue a degree in journalism and public relations. He is retired now, and lives in Temple Hills, Md. Nagro visited the Air Force Memorial for the second time, May 8, with his American Legion post and a friend from the Marines. He said he's glad for both the Korean War Memorial and the addition of a memorial to honor Airmen. "They really needed one," he said. "It's very inspiring."